Seen on the picture from the back: Acting Municipal Manager Muzi Mayisela, Deputy Mayor Cllr Dudu Sibiya, Front: Magistrate Gurlal and Cllr Sizwe Mngomezulu. 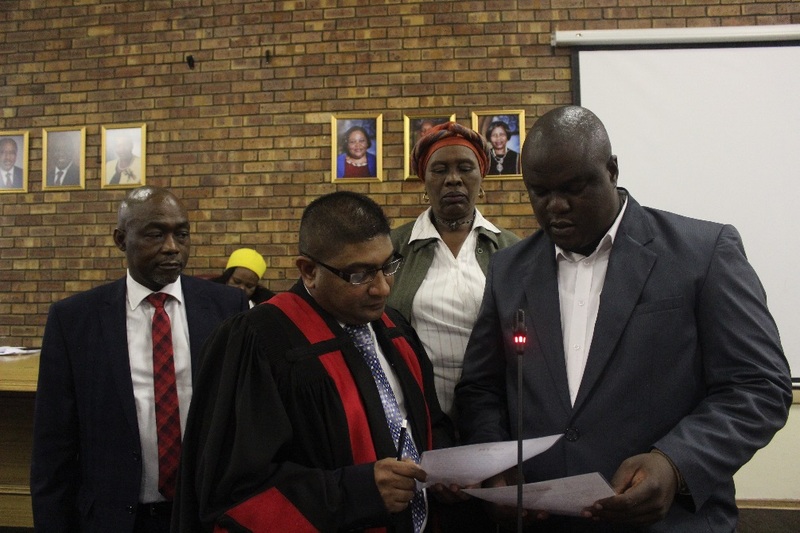 The Newcastle Municipality sworn-into office a newly elected councillor during a council meeting that was held at the Newcastle Council Chambers yesterday. Cllr Sizwe Mngomezulu who was elected as the ward 22 councillor, replaces late Cllr Sibusiso “Mpha “Hlabisa who passed on late last year. Present to witness this prestigious event was the whole of EXCO, councillors and members of the community. To officiate the induction, Court Magistrate Gurlal was also present. Cllr Mngomezulu swore under oath to serve the community without fear or favour. He promised to carry forward the mandate given to him by council which is in line with the vision and mission of the Newcastle Municipality. Council welcomes the newly appointed Cllr.